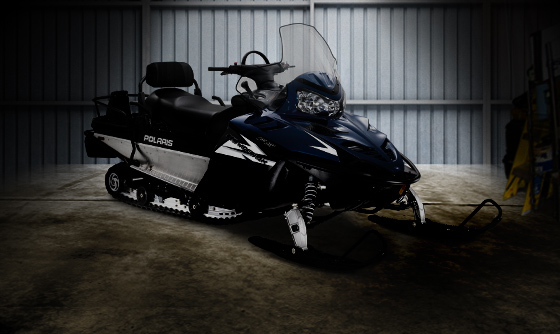 Before you pull out the boat and put away the Polaris® this spring, follow these simple preventative measures to prolong your sled’s life span. Step 1 is to remove any corrosive salt or acids from all surfaces. Step 2 is a good wash and wax for your hood, side panels, chassis, and all other plastic. Next, wipe remaining surfaces with a damp cloth. Only after a thorough cleaning should you apply touch-up paint, if needed. Store your Polaris in a dry garage or shed, out of direct sunlight, and covered with a fabric cover. Condensation can form under a plastic tarp and could damage some components. Any snowmobile stored for more than 60 consecutive days should have its engine “fogged.” The process spreads a thin layer of oil that protects rod pins, cylinder walls and crankshaft bearings from the corroding effects of humidity. Always add Premium Carbon Clean, Sea Foarm or a fuel conditioner/stabilizer to the fuel tank. Follow the instructions on the container, running the engine for five minutes to get additives through the entire fuel system. Top off with fresh fuel. Do not allow the snowmobile to run out of fuel. Moderate track tension should be maintained during summer storage. The snowmobile should be supported off the ground to allow the track to hang freely. Remove your Polaris’ drive belt and store it in a cool, dry place. Do not lubricate your clutch components, except the drive clutch shaft bushing, as outlined in the Master Repair Manual. Replace any worn or frayed electrical wire or connector. Your wiring harness should be secured away from sharp edges, steering linkage, moving parts, and hot exhaust parts. Prior to storage, charge your battery to full power. Check its voltage every three months and charge as required. If possible, place the battery on a voltage-regulated charger to maintain proper voltage. This entry was posted in Tips and tagged ICE FORCE, James Holst. Bookmark the permalink.